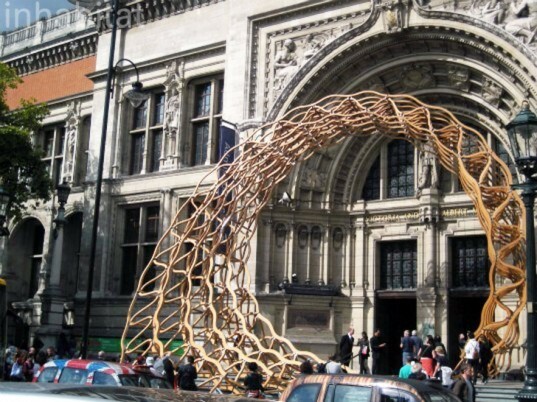 This majestic Timber Wave installation was recently unveiled at the entrance to the Victoria and Albert Museum, where its elegant undulating form welcomed visitors to the London Design Festival. Transforming the front of the magnificent museum, the giant three story tall timber sculpture towers above people passing beneath it. This spiraling latticework is the collaborative creation of award winning architects AL_A along with engineering firm Arup, who responded to the original V&A entrance with a design that enhances the existing grand facade. Constructed from oil-treated American oak, the cascading wave connects the bustling street to the interior design exhibits hosted by the museum. The outdoor installation unfolds in the organic form of a wave yet it elegantly integrates within the surrounding urban environment. Using furniture making lamination techniques, the designers created the elaborate three-dimensional form by precisely calibrating each timber piece. The multilayered wave rolls up into a curve as though it were one dynamic crest, and it’s every bit as dramatic as the entrance archway beneath it. This unique asymmetric structure will grace the steps of the V&A until October 15th. The design is constructed from oil-treated American oak. The outdoor installation unfolds in the organic form of a wave yet it elegantly integrates within the surrounding urban environment. The cascading wave connects the bustling street to the interior design exhibits hosted by the museum. Using furniture making lamination techniques, the designers created the elaborate three-dimensional form by precisely calibrating each timber piece. The multilayered wave rolls up into a curve as though it were one dynamic crest, and it's every bit as dramatic as the entrance archway beneath it. The multilayered design rolls up into a curve as though it were one dynamic crest. 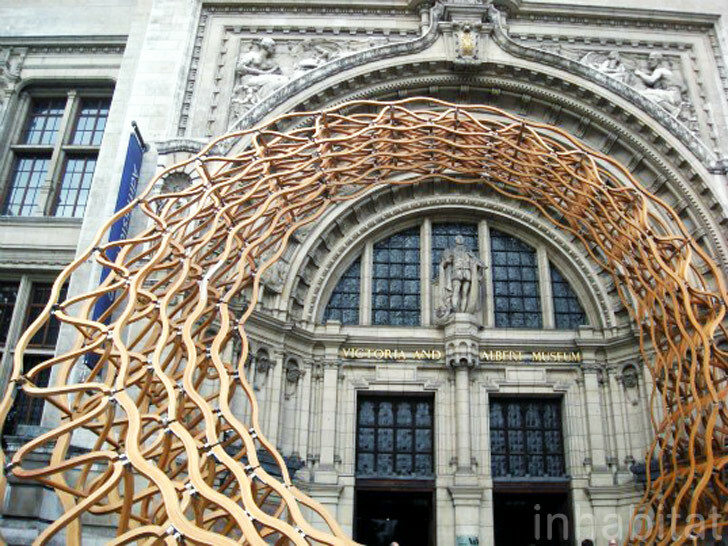 This unique asymmetric structure will grace the steps of the V&A until October 15th.